Discovering the capital is like leafing through a history book, there is arguably more to see in Rome than any other city in the world. Soak up 3000 years of history and marvel at the most iconic sights such as the Colosseum and Arch of Constantine, the Forum, the Pantheon, Spanish Steps, Via Dei Condotti and Piazza Venezia. Recharge with a slice of succulent pizza and a strong espresso in Piazza Navona home of Bernini's Fountains of the Four Rivers, throw a coin into the Trevi Fountain and make a wish to return to the eternal city. No visit is complete without a trip to Vatican City and St Peter's Basilica. Climb up the dome for breathtaking views over the city. Art-lovers should not miss a visit to the Sistine Chapel to admire the timeless work of Michelangelo. 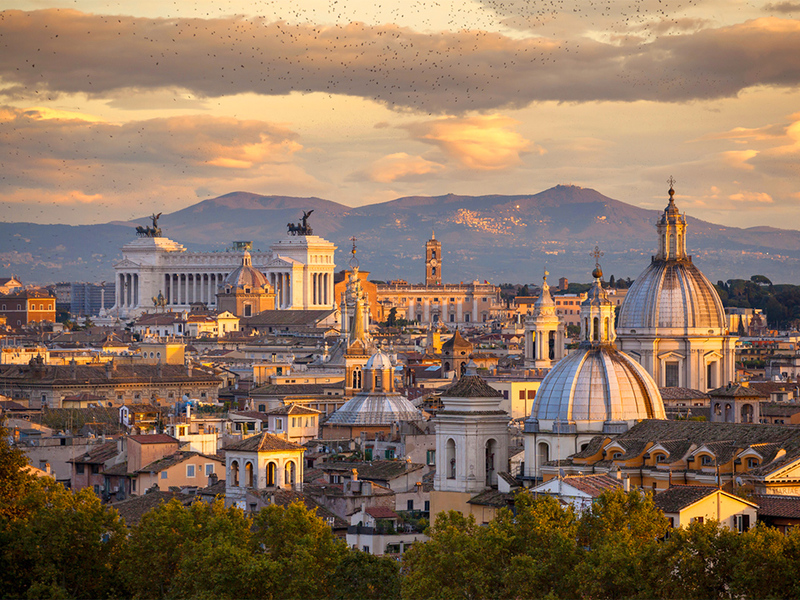 Enjoy the city like a local and stroll the many piazzas often described as immense open-air museums, wander the winding streets of Trastevere and head for local gastronomic fling in one of the many restaurants and trattorias. Enjoy La Dolce Vita in the eternal city, Rome is the perfect spot for indulging in delectable cuisine, enjoying café culture and people-watching. Its streets are packed full of restaurants and trattorias that cater to every taste. Local specialties include pastas such as carbonara (egg, cheese and bacon) and amatriciana (tomato, bacon and chilli). 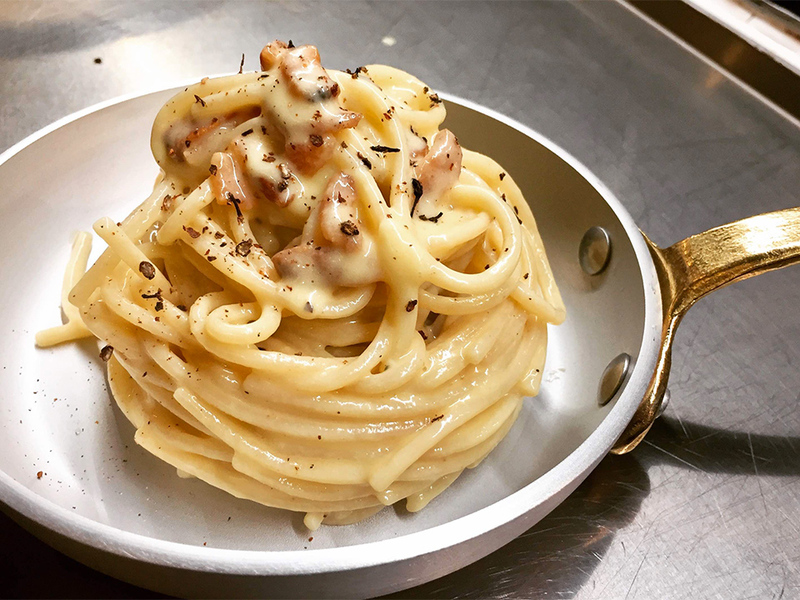 For more creative interpretations of Mediterranean and traditional Roman cuisine head to one of the mouth-watering Michelin-starred establishments where abundance is combined with rooftop terraces, charming historic interiors and magnificent views of iconic city that make for truly memorable dining. 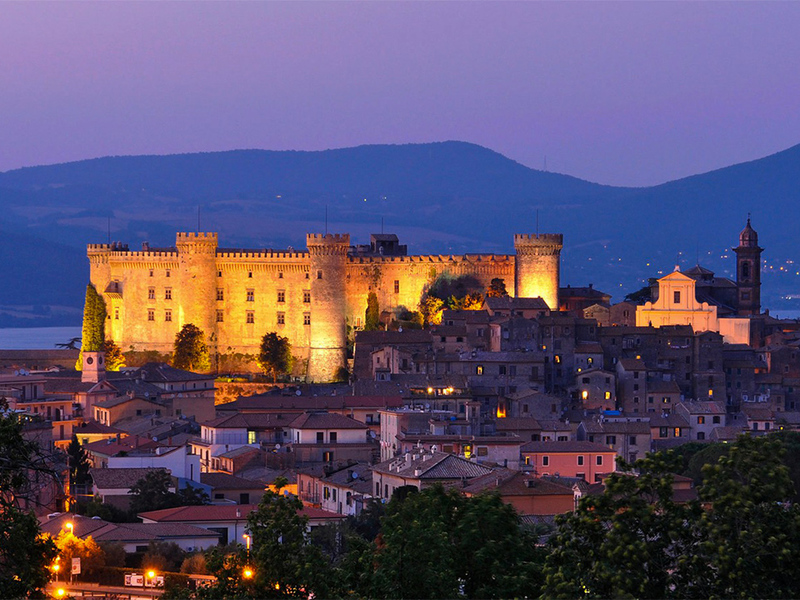 For a more local and typical culinary experience head to the nearby Castelli Romani. In Frascati, you can feast on porchetta (herbed spit-roasted pork) and local white wine in one of the several cantine (cellars) in town. For a more refined meal, head to Castel Gandolfo and the Antico Ristorante Pagnanelli, a landmark restaurant offering seasonal food and dreamy views over Lake Albano. A great variety of cultural activities are available to experience while staying in the capital, you will certainly not be at a loss for things to do. Operas are an integral part of life in Rome, and can be enjoyed at a variety of venues such as the stunning outdoor opera venue at the Baths of Caracalla. If you prefer rock, jazz, or blues over classical music, there are several venues where you can listen to solo artists and bands around the city. Rome is one of Europe’s greenest capitals, if you feel tired of sightseeing heal yourself by exploring one of the numerous city parks. Climb the 135 Spanish Steps of Trinità dei Monti and reach the Pincio gardens, on the western edge of Villa Borghese. It is the third largest park in the city home to the the lake with the Esculapio Temple and to the Bioparco hosting nearly 1.000 animals of 200 different species from all over the world. The capital also hosts a number of important sporting events throughout all year, including rugby, tennis, golf, and football. Families with children have a vast choice of amusement parks suiting all tastes. The Luneur Park is Italy’s first true funfair and one of the first five in Europe, a wonderland immersed in green featuring a wide range of fun-filled activities and merry-go-rounds. With its 35 attractions Rainbow magic park is the ideal family entertainment park offering something for all, from toddler to grown ups. Cinema lovers cannot miss Cinecittà World, the theme park dedicated to films and the film industry. Situated about 20 km south of Rome, the Acquapark Zoomarine is perfect for a summer visit offering also the chance to get to know a vast array of some fantastic animals such as dolphins, seals, penguins, and birds of prey. Far from the hustle and bustle of the capital, the region of Lazio offers a great variety of attractions pleasing even the most discerning traveller. Walk the ancient streets of Ostia Antica, a smaller version of Pompeii, this engrossing archaeological site showcases the remarkably well-preserved ruins of ancient Rome’s sea port. Step back in time and explore the Cerveteri's necropolis, Unesco site, or stroll through the Etruscan picturesque village of Civita di Bagnoregio. If you feel overwhelmed by the abundance of culture and history, take a break and head to the fabulous volcanic Lake Bolsena surrounded by rolling hills and vegetation or Lake Bracciano for a lakeside relaxing day out in nature or unwind on one of the beaches along the coastline of beautiful Tyrrhenian sea. Lush hills, quaint medieval villages, thermal spas, so much is to discover, along with countless activities to undertake. Rome hosts the names of Italy's finest designers. The shopping life line of the centre is Via del Corso, for a flavor of the best head for the area near the Spanish Steps dazzling with glamorous boutiques, in particular prestigious and exclusive Via dei Condotti and Via Borgognona. 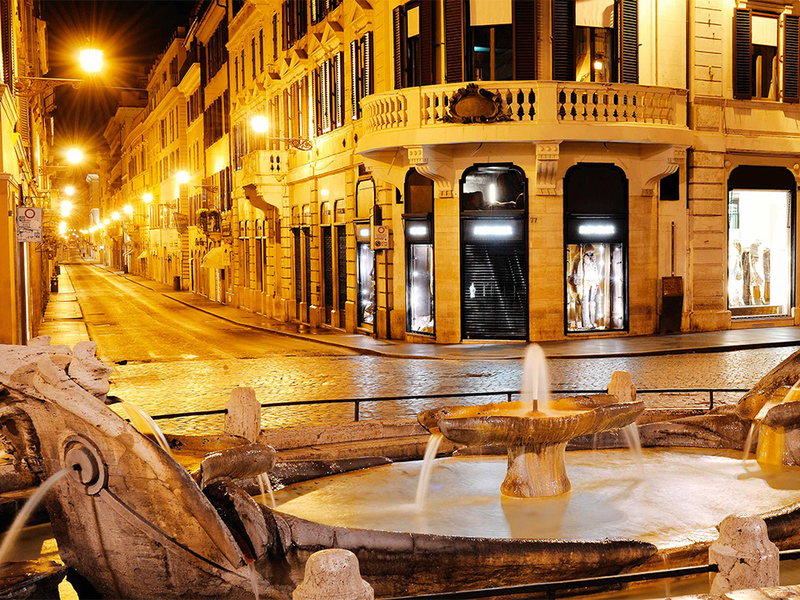 Areas of the city dazzle with glamorous designer boutiques and flagship stores, you can find the most refined studios and ateliers where you will admire the finest artifacts while in other areas the stores are small, quirky and full of character, Rome’s shopping scene offers something for all tastes. Rome is a glorious place to visit no matter what time of year. Weather-wise, spring and fall are the best seasons to visit Rome, days are mild and nights are cool, and the crowds aren't so intense. Summertime time is perfect for sightseeing, dining at an outdoor café and enjoy the festival vibe when piazze and parks come alive with music from local bands and cultural events. Although the weather can be chilly, a visit to the eternal city during December is a lovely option to soak up the festive atmosphere and enjoy a great variety of cultural events in churches or theatres.